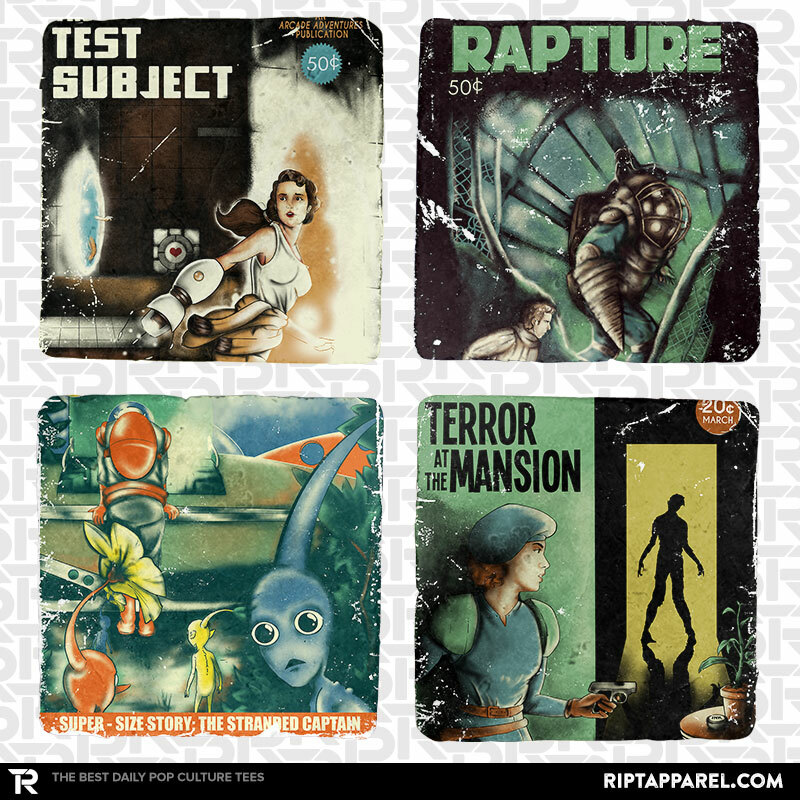 This March, RIPT Apparel featured a selection of artist Creative Outpouring’s newest work. It consists of retro pulp sci-fi book covers featuring some more recently acknowledged video game heroes and motifs. We call it “Arcade Adventures.” You can see the whole collection here until the end of March, 2015. Today, RIPT Staffer Atomic Rocket interviews Josh Ketchen, Creative Outpouring’s mild-mannered alter-ego. This artist-to-artist interview reveals some interesting tidbits about how his art is created and why he does it. -Where did your artistic abilities come from? One can only assume you were bitten by a radioactive spider in a high school art room. You’ve assumed mostly correct except it was a dog bite! But no, really, I’ve been drawing since I can remember. It started when I was really little, I used to draw my own superheroes and make these comics(with hardly any text) and just a ton of fighting. One of my earliest memories was all the kids in my second grade class wanted me to draw X-Men on these little manila folders we used to put our work in. It was a HUGE distraction in class! -What’s the origin story of your artist name, Creative Outpouring? Around 2012 I was starting to do more and more freelance design work while I was looking for a stable design job. I wanted to make a “company” of sorts but I didn’t want to limit myself to just design, I wanted it to be an outlet for all the things I do that I find creative. I write, I play music, I draw, I paint. I figured Creative Outpouring was a name that kind of encapsulated all of that without saying too much. Also when abbreviated it says C.O. for company which makes me chuckle slightly. –Did you ever receive a formal art education? Is art a fairly new thing for you or have you been drawing little Creative Outpouring could hold crayons? I have some formal training. I went to school for Graphic Design and we had to have a lot of drawing classes etc. but I’ve been drawing well before that. –Did you always know you were going to be an artist? Were you originally on track to becoming a business man? I’ve always known I would do something with art to some extent. I played music pretty seriously for a while and I thought that was more the outlet I would take. For a while illustrating/design was on the backburner, but nowadays it’s kind of shifted dramatically. Music has become more of a project now and design has become more the thing I choose as a medium for ideas. -What are you favorite types of designs to create? Would it be mash-ups, illustrations, parodies, logos, portraits, or something entirely different? My favorite type of design would probably have to be retro stuff. More painterly things. I really enjoy the challenge of trying to get the most out of limited color amounts. I also am really loving the concept art I’m working on for a board game I’m making. It’s a lot of fun to kind of go nuts and not feel the need to reference anything sometimes. -I absolutely LOVE your Lord of the Stars design. I own it. I wear it at least once a week. Do you have a personal favorite that you’ve designed? Wow thank you! it’s really cool seeing people wearing my tees at conventions, expos or out and about and all the nice things people have to say are always so awesome. My favorite design would have to be my HE-MAN/Adventure Time Mash up. Just seeing the art makes me want to chuckle and that’s always a goal of mine when it comes to tees. -Do you have another talents/hobbies that you’re really passionate about? I’m really passionate about music. I’ve played in bands here and there and I love to write and arrange songs. I’ve learned a bunch of instruments from guitar to accordion. -It probably comes as no surprise that your work inspires a lot of artists out there. Myself included. Are there any artists who influence/inspire your work? First off thank you! And yeah there are a ton of artists that really inspire me in the shirt biz and outside. I really enjoy your work (Atomic Rocket) as well as the work of Sumrow, Jango Snow, Emilie Boisvert, Nathan Davis and a TON more. Outside of the tee shirt game I really enjoy Norman Rockwell, Akihiko Yoshida, Drew Struzan and all those vintage sci-fi/fantasy book cover artists did really amazing stuff for some of the most odd stories. –Is Creative Outpouring your only job? If not, what other work do you do? Creative Outpouring is actually my secondary job. I also work at a Community College as a Graphic Designer. –Star Wars or Star Trek? –-Listening to any music or podcasts while you work? I listen to a lot of both. I’ve been lately listening to a lot of chilled down music (Washed Out, Millionyoung, EDJ) and the new Decemberists album is really awesome. For podcasts i’ve been listening to Smodcast, Invisibilia and Dungeons and Randomness. –Lastly, any well seasoned advice for the noobs out there? Have fun! Don’t worry so much about trying to get successful overnight. Lastly, always show passion and excitement in everything you do. Nothing is more important than being happy and passionate about your art. PrevAn interview with Atomic Rocket – RIPT Apparel’s featured artist for February 2015NextHappy Force Friday, RIPTsters!